Buffett says the Fed has to be careful not to raise rates too far ahead of Europe and Japan. OMAHA, Neb. — Investor Warren Buffett says the Federal Reserve and other policymakers are generally doing a good job, but it’s difficult to predict all the effects of interest rates remaining low for this long. Buffett said on CNBC Monday that no one can predict the effects of prolonged low rates because it has never happened before, but the U.S. economy has substantially recovered from the depths of the recession in 2008. “Very few people in 2009 would have dreamt that we could have this duration of low rates,” Buffett said. But policymakers have to be careful not to raise U.S. interest rates too far ahead of Europe and Japan because of unintended consequences of the imbalance, Buffett said. 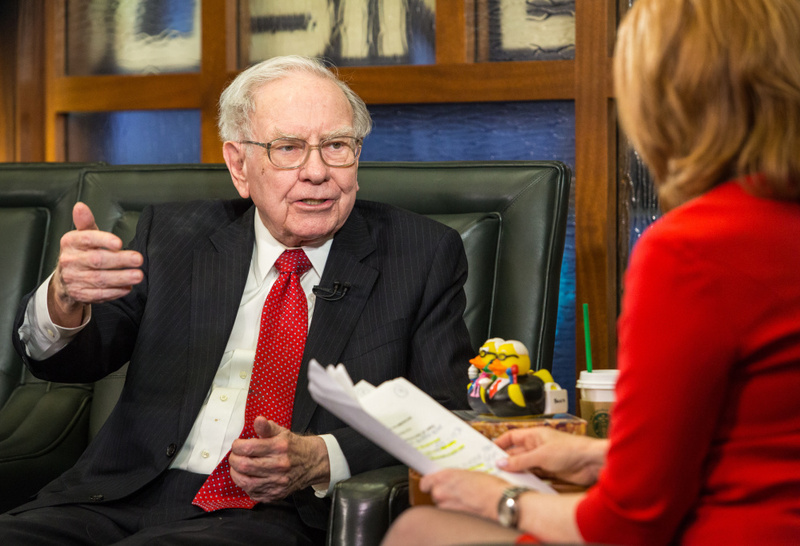 Buffett appeared on CNBC Monday after spending more than five hours answering questions at Berkshire Hathaway’s annual meeting Saturday. Berkshire Vice Chairman Charlie Munger and board member Bill Gates joined Buffett for part of the interview. Munger said he thinks U.S. policymakers should have invested more in infrastructure to invigorate the economy after the recession instead of relying so much on fiscal policy. “I strongly suspect that it was massively stupid for our government to rely so heavily on printing money and so lightly on fiscal stimulus for infrastructure. I think that happened by accident because our politicians couldn’t agree,” Munger said. Buffett estimated roughly 40,000 people attended the shareholders meeting for the conglomerate he leads. So this year’s addition of a webcast of the meeting didn’t result in a significant drop in attendance from last year’s crowd that was close to 45,000. Buffett said choosing the next president will be important for the world, but it won’t derail the U.S. economy. “Electing the wrong president won’t damage the U.S. economy,” said Buffett, who supports Democrat Hillary Clinton. On another topic, Buffett said Valeant Pharmaceuticals’ practices were flawed, so he declined to invest Berkshire Hathaway’s money in the company after some Valeant investors urged him to look at the company. “I don’t think you’d want your son to grow up and run a company the way Valeant was run,” Buffett said. Munger, who also serves on a hospital board, was more direct in his criticism. “They were robbing our hospital. They raised a heart drug that old people really need by 500 percent,” Munger said. Valeant is dealing with intense scrutiny of its business practices, a huge drop in stock price and insurers are demanding discounts from its drug prices. Current and former Valeant officials were grilled by Congress last week over the company’s strategy of buying up older medicines with limited competition and then jacking up their prices many times above prior levels. Buffett said he would be willing to sell Berkshire Hathaway’s big investments in American Express, Coca-Cola and other companies if he found a significantly better option, but he still believes in those companies. Berkshire Hathaway Inc. has held major stakes in American Express and Coca-Cola for decades, so the company would face a significant tax bill on the gains if he did ever sell those investments. Buffett said the tax implications are a factor in his decisions. “The case for switching has to be more compelling,” he said. Buffett said he likes owning roughly 15 percent of American Express’ stock even though competitors are trying to develop a better way to process payments. Berkshire owns about a 9 percent stake in Coca-Cola Co.